Mass Maharaja Ravi Teja is coming with a Mass Entertainer after the hilarious Classy Comedy Action entertainer ‘Raja The Great’ which is a comeback movie in his career. This time again Ravi teja introducing new comer Vikram Sirikonda as a director for his latest flick titled Touch Chesi Chudu. 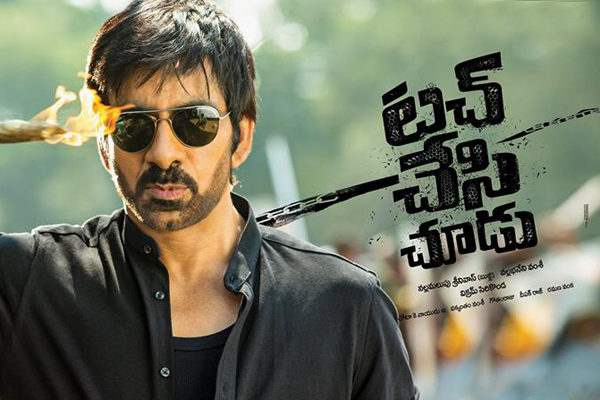 Ravi Teja playing as a serious Cop Role in this movie. Ravi Teja played as Powerful Cop in movies like ‘Vikramarkudu’ and ‘ Power’. Rashi Khanna is playing opposite to Ravi Teja for second time after ‘Bengal Tiger’. 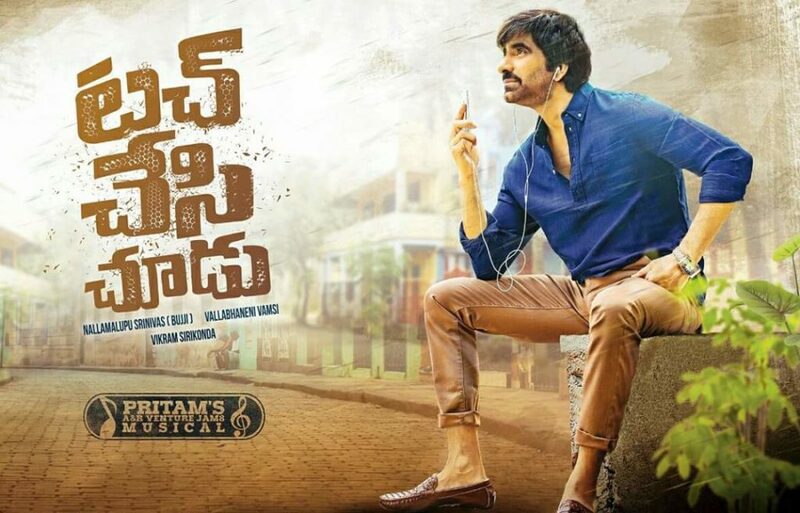 Ravi Teja , Raashi Khanna, Seerat Kapoor, Freddy Daruwala, Murali Sharma, Satyam Rajesh, Jayaprakash, Vennela Kishore, Suhasini Maniratnam playing lead roles in the movie. The movie producing by Nallamalupu Bujji, Vallabhaneni Vamshi Mohan under Sri Lakshmi Narasimha Productions Banner. Directed by Vikram Sirikonda, Story by Vakkantham Vamsi, Written by Sreenivasa Reddy, Ravi Reddy and Keshav, Music Composed by JAM8, Cinematography by Richard Prasad, Chota K. Naidu, Screenplay by Vikram Sirikonda, Deepak Raj and Editing by Gautham Raju. Karthikeya(Raviteja) who lives in Pondicherry and the director of Karthikeya Industries. Karthikeya who loves his family very deeply that he always have concern about his family and never had a thought of that he could bring bad image to his family. Karthikeya’s father(Jaya prakash) always worried about his son marriage. Karthikeya accepts marriage proposal that he don’t want to to hurt his father and engaged with Pushpa(Rashi Khanna) for marriage. Karthikeya hurts Pushpa 2 times unwantedly. The Major reason behind this incident is Karthikeya doesn’t know how to behave and deal with Ladies. Pushpa makes break up with Karthikeya for this reason, but remains love him Innerly. Pushpa’s love towards Karthikeya made her to break his marriage with another girl. Later once upon a time Karthikeya opposes marriage with Pushpa. The other end a Rowdy sheeter named Selvam diverts the missionaries of the Karthikeya’s Company. Karthikeya lodges a complaint regarding this issue, but Police doesn’t respond well and no action taken by the police. Karthikeya Irritated with Police Behavior and fires on them that it will be the issue of 2 minutes to resolve it, but Police are not taking care of it. Local CI angry about Karthikeya’s behavior and gives 2 minutes time to resolve the issue. Karthikeya shows his power at that moment. At the same time some one kills a person named Sathya who is son of workman in Karthikeya’s company. Karthikeya’s sister watches the murder and told to his brother and she found that accused and Assailant is Irfan Lala. But the question is Irfan who is already dead and how he came live and murdered. what is the relation between Karthikeya and Irfan. Why Police Commissioner (Murali Sharma) lied to Karthikeya. What is the incident of Mujaffer pet Quarrels and who is Lala there, Why Karthikeya’s marriage Proposal break down which was came up to engagement. Why Divya breaksup with Karthikeya who loves him very deeply are the rest of the Story. As usual Mass Maharaja Ravi Teja done exceptionally well to his role with his Style of mass action, body language, dialogue delivery and Energetic performance. 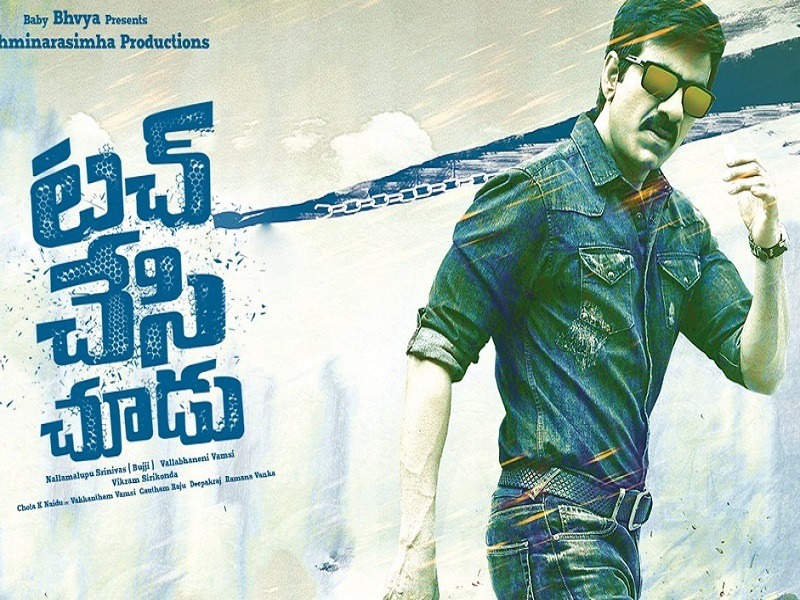 Mass Maharaja Ravi Teja maintained the intensity as a Powerful Police Officer in this movie. Actress Rashi Khanna and Seerath Kapoor has done Justice to their roles, But they don’t have much scope to their Characters in the movie. the Other Lead roles Freddy Daruwala, Murali Sharma, Satyam Rajesh, Jayaprakash, Vennela Kishore,Freddy Daruwala, Murali Sharma, Satyam Rajesh, Jayaprakash, Vennela Kishore, Suhasini Maniratnam done justice to their roles. Director Vikram Sirikonda Narration and Screen play were Good. Some Action episodes are with high intensity. Vikram Sirikonda as New director well tracked and handled the subject as a new comer. 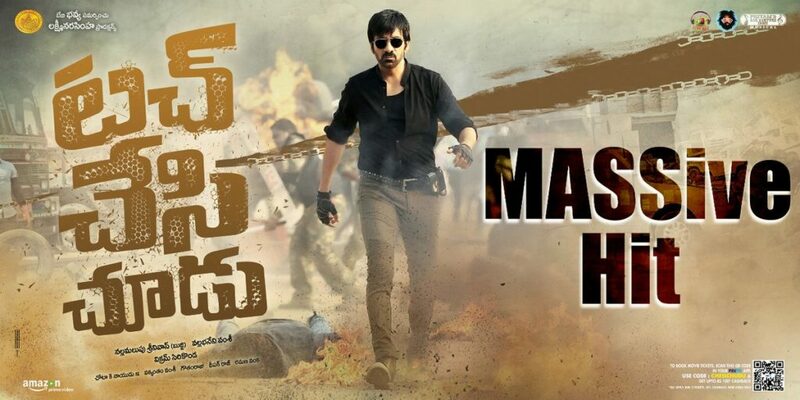 Vakkantham Vamsi Story writing is a bit formula writing for Ravi Teja keeping him in mind. Richard Prasad, Chota K. Naidu Cinematography experience seems on Screen which is a good asset for the movie. Songs composed by Jam8 not up to the mark and the Back Ground Score composed by Mani Sharma is a big asset to the movie. Audience are expecting freshness and innovative stories with creativity which is a known fact with recent releases in Tollywood. Mass Maharaja Ravi Teja Touch Chesi Chudu is Commercial Mass Entertainer, Worth to One time Watchable and Good one for Fans. The post Touch Chesi Chudu Movie Review appeared first on Amaravathi News Times.